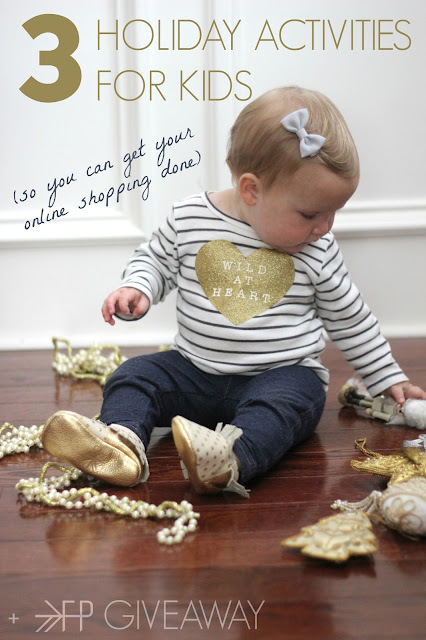 Christmas is approaching quickly and we have so many things on our "to do" list! Today my list includes unpacking from vacation, doing a lot of laundry, and checking out some awesome Cyber Monday deals while I try and entertain my kids. 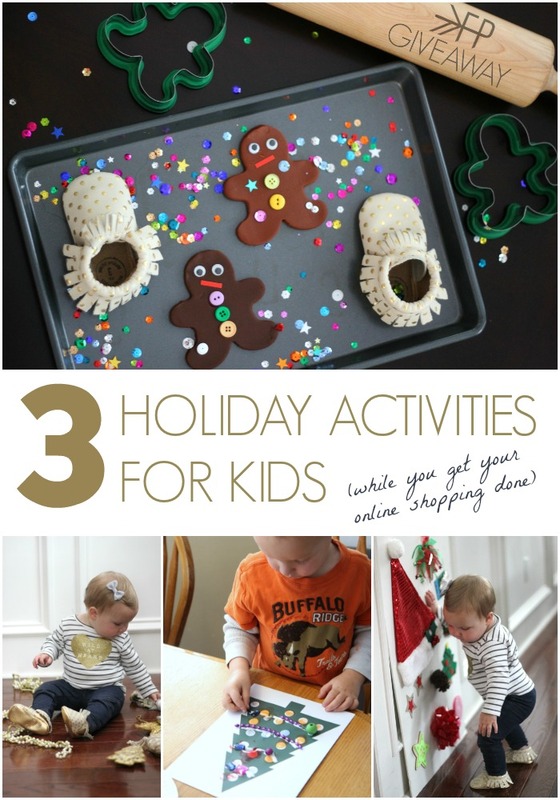 If you're planning on doing some online holiday shopping, here are three holiday activities you can try with your kids today and they just might get so excited about them that you can actually jump online for a minute or two and check out some good Cyber Monday deals!! Make sure to scroll down and check out our Freshly Picked giveaway too! One of the Cyber Monday sales I am MOST EXCITED about today is happening over at Freshly Picked!! If you aren't familiar with Freshly Picked moccasins, you can check them out here. 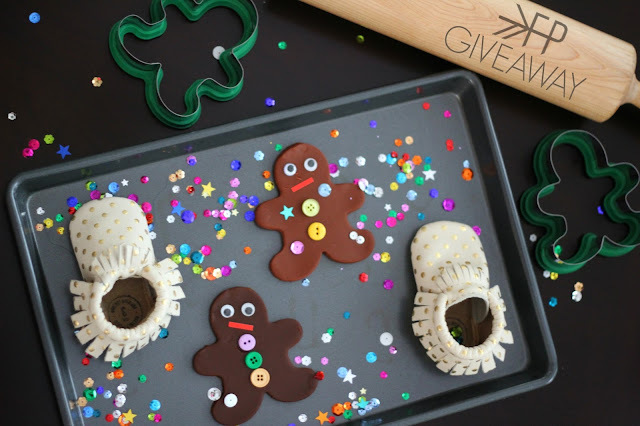 They are super cozy, durable, adorable handmade leather moccasins for little ones. If you follow me on Instagram then you have seen them before. My 10 month old wears hers basically every day. LOVE THEM! TODAY ALL FRESHLY PICKED SEASONAL STYLES ARE 25% OFF. The sale is ONLY for 24 hours and starts at 10 am MST (mountain standard time) on Monday, November 28th (today). Go to the Freshly Picked website for details. 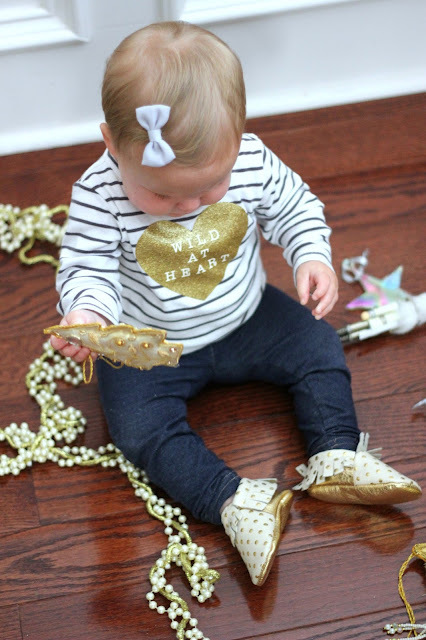 We recently got the heirloom in cream and gold moccasins from our friends at Freshly Picked and I love them for the holidays. They make every outfit look a little more festive. I also bought the platinum moccs and classic birch moccs which go well with just about anything. They totally keep my little cutie's feet safe from all sorts of things as she crawls and cruises around everywhere! Alright, so now that you know all about the Cyber Monday awesomeness, here are three activities to try with your kids today while you attempt to do some online shopping too! This activity is so easy, but so fun. Roll out some playdough (you can make your own or just buy some like I did). 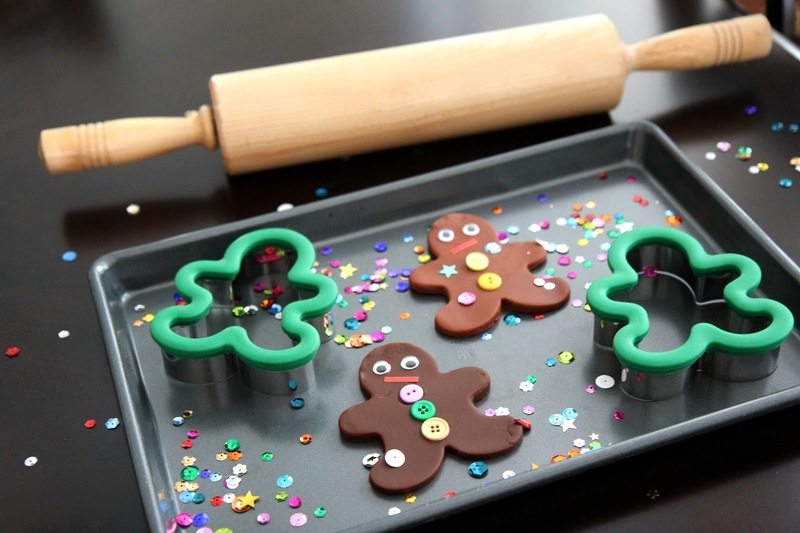 Next cut out some gingerbread boys from the playdough and places them on a clean baking sheet along with some embellishments (sequins, googly eyes, buttons, ribbon, etc). Have your kids start creating! I use the baking sheet because it contains the mess a bit. The kids thought it was so goofy to be pretending to make gingerbread people out of playdough. Grab a piece of white foam board, some Christmas decorations from the Dollar store, and a glue gun. Glue everything onto the white foam board and let your kids start exploring! Make sure you include something with a big jingle bell on it! You can find my full Christmas sensory board tutorial here. It is really SO easy. Stick it on the floor or the wall with painters tape and kids will love playing with it. Print out my Christmas tree printable here. 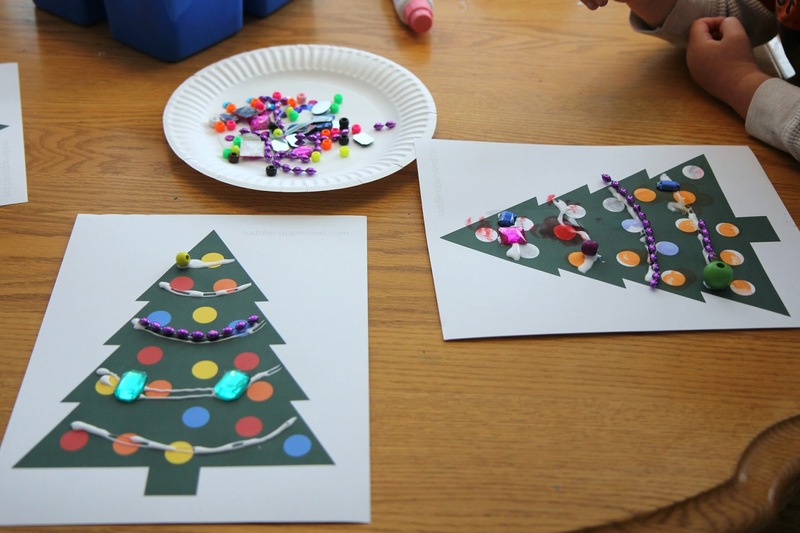 Grab some white glue and embellishments and start decorating your trees! If you have littler kids, use bigger materials that won't be choking hazards (big pom poms, big buttons, etc.). Let them dry and display! DO YOU HAVE ANY OTHER FAVORITE SEMI-INDEPENDENT HOLIDAY ACTIVITIES YOUR KIDS LOVE? 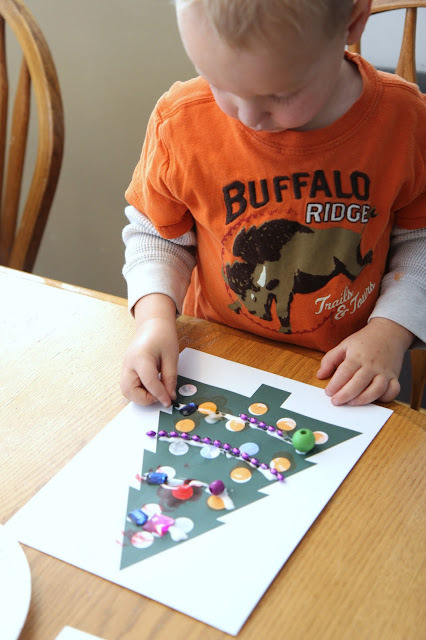 You can find more of our favorite simple Christmas activities here. I'm happy with anything that will keep my kids from destroying the house and breaking anything while I try and get my Christmas shopping done! I love to set the kids up with an activity at the kitchen table and then I'll just pull up my laptop or phone and get a few things accomplished while they create. It is a win-win for everyone. In addition to some fun activities, we have an exciting giveaway to share with you today! Freshly Picked is going to give ONE giveaway winner ONE PAIR of moccasins in any color/size they would like! Just follow the steps below to enter the giveaway. 1. Follow Toddler Approved and Freshly Picked on Instagram. 3. Tell us your favorite holiday activity to do with your kids in the comments on my Instagram post for an extra entry. This giveaway runs from Monday, November 28, 2016- Saturday, December 3, 2016 (at 11:59pm PST). Winner will be posted on Sunday, December 4th. Winner must reside in the US. Winner can't have won any other giveaways that have included a pair of Freshly Picked moccasins in the last 60 days. This giveaway promotion isn’t sponsored, endorsed or administered by, or associated with Instagram. By entering, entrants confirm they are 13+ years of age, release Instagram of responsibility, and agree to Instagram’s term of use. Disclosure: This giveaway is sponsored by Freshly Picked. All opinions shared in this post are my own!